3:35pm In the living room – Ika, Sarah, Heather, Jon, Rachelle, Sabrina, Andrew and Neda are sitting on the circle couch. The house guests are speculating on what the mug would signify. (The house guests found the mug in the kitchen earlier today.) 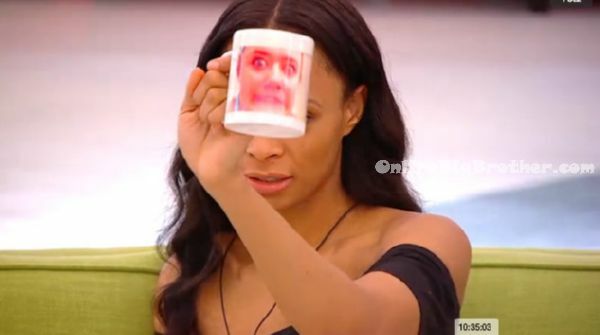 Ika looks at the mug and holds it up and says that the person on their mug should enjoy their 15 minutes of fame because that’s all they’re getting. They talk about how their reward said they would get a “ring” so they wonder if they’ll be getting a phone call. They wonder if the mug has to do with a twist. Or if someone’s going to come into the house. IKA asks if Andrew is up and IKA is up what will Sabrina do? Sabrina explains that she will vote to keep a girl but will not put up Andrew if she wins HOH. IKA and Sabrina disagree think it will be one of the girls. Neda wonders if they can get Adel to take out Heather. Sabrina doesn’t think so. Sabrina says Adel winning is the worst case scenario. IKA and Sabrina think they will be Adel’s target. Neda thinks the next HOH will be mental which might help Adel because there is a element of luck. IKA says Adel is stupid. Neda says girls are her number one priority she goes on and on about how she will be loyal to girls first. Big Brother Canada 2 – Power Of Veto Ceremony RESULTS! Adel says I surrender! 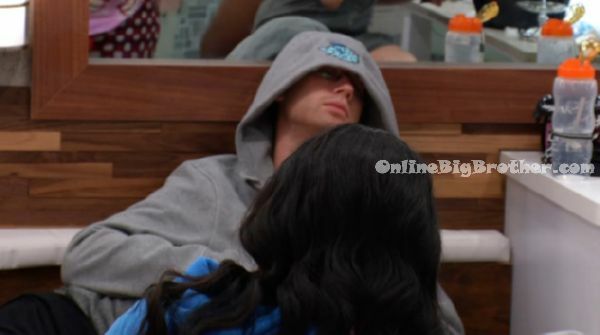 12:45pm When the Big Brother Canada live feeds get turned back on after being blocked for the Power of Veto ceremony we learn that Kenny used the POV to take Neda off the block. As HOH Andrew had to name a replacement nominee and he picked Kyle to go up on the block for eviction. In the living room – Andrew says I would love for Paul to call me out for not being honest with him. Meanwhile out in the hot tub room – Sabrina, Kyle, Adel, Paul, Rachelle, Heather and Jon are talking about loving this experience and about other random things. Adel says so Paul?! Paul says wow dude this game is insane! Adel says I surrender! 8:45am Big Brother wakes up the house guests. They’re all complaining that they didn’t get enough time to sleep. The tv screens in the living room say power of veto ceremony today. In the bedroom – Sarah is not feeling well. The others say that she’s not feeling well because she’s on slop and had exerted a lot of energy yesterday. Arlie was rubbing her back talking to her trying to make her feel better. He then got Sabrina to sit with Sarah and he went out into the living room and stood in front of one of the camera and started freaking out at big brother to get Sarah the medication she needs. The other house guests tell Arlie to calm down and to stop. Paul agrees that no one should have to wait for medication. He says its stupid for people to have to wait an hour for gravol medication when its not a prescribed medication. 3:35am The Big Brother Canada live feeds get turned back on after the Power of Veto Competition. Sabrina goes up to the HOH room to talk to Andrew, Arlie and Kenny. Sabrina says that Ika told her that the guys were annoyed with me. Andrew says we aren’t annoyed with you, we said that you are an emotional person and we need to be supportive of you. Sabrina says that the girls are mad at me because I accepted Kyle’s apology. The guys tell her that it was a good decision to accept his apology. Andrew talks about how he made the decision to make this place tolerable by making peace with Paul. Sarah and Rachelle join them. Kenny says I will be civil and nice if they walk out the same way. Sarah says that she is going to go to bed tonight. Andrew says but we’re supposed to get a reward tonight. Arlie says Adel insinuated that. Ika does like her now. IKA says if Heather had won HOH she would not have put the two of them up. Ika and Sarah both say they feel bad for the way they treated Heather in the beginning. IKA says she heard something last night that scared her “last night in the bed sabrina was talking to me.. if the boys wins HOH again I’m going to have to go with them. ” Ika adds sabrina will choice herself over the girls alliance. Kenny, Arlie and Sarah look for a SECRET PASSAGE WAY! Sarah says I hate being here! All the crazy s**t. If I didn’t believe our 5 would make it, I wouldn’t be here! 4:30pm ALL four of the live feeds are blocked but the 5th cam is showing the war room where Nate, Allison and Scott are watching the live feed spy screens trying to figure out what’s happening in the house. The other 4 cams come back on and Sarah is talking to Sabrina in the bathroom. Sarah tells Sabrina – I truly truly truly do trust in our alliance. Arlie joins them and they talk about whether or not the other girls are playing both sides. Sarah says that she know Rachelle has a fake deal with Jon and Kenny. I don’t trust Rachelle. I also know she told them that I was the head of the girls alliance. Arlie says that he’s going to tell them something but they can’t repeat it. Arlie tells them that Andrew is afraid of being played by Heather. Arlie says that Andrew won’t ditch us for them .. he cares too much about what his family and friends think. 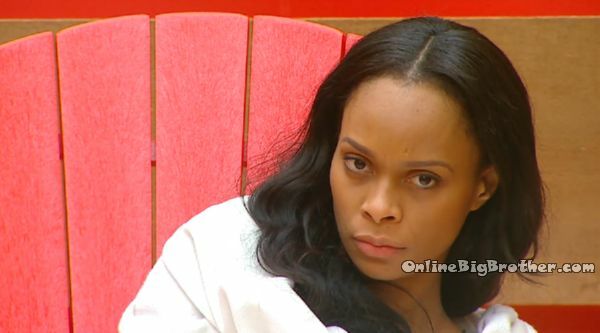 Sabrina comments on how worried she is that she’ll be nominated if Adel wins HOH. Arlie tells her to not worry about a 2% chance of something happening. Not to mention you have all of us, we love you. Sarah tells Sabrina that believes their 5 will make it to the final 5. WAR ROOM Task – Match up 13 FACTS with Bobble Head House Guests! 1:45pm The live feeds return with the war room on all 5 cams. The 3 Final Hg’s Nate, Scott and Allison are given a task to match up 13 facts with each of the bobble heads. They are told that they have 30 minutes to lock in 13 facts to earn a special scene from the big brother house with sound. They are confusing Sabrina with Rachelle. Facts: Super Fan, Douche bag, Model, Inventor, Motivational Speaker, Minor League Hockey Player, Life Guard, Tattoos, Teen Mom, Married, Princess, etc. Big Brother Canada 2 – Kyle says so this is what it feels like to be a loser. 11:15am In the bathroom – Sabrina, Ika, Rachelle and Neda are in the bathroom talking about all the trips they will do together when they get out of the house. They talk about going to LA, Vegas, etc. Meanwhile – Adel, Kyle and Paul hangout side the HOH room on the chairs. They laugh about how screwed they are in the game. Kyle says so this is what it feels like to be a loser. Adel says I’m stuck in a spider web and I can’t get out. Kyle says I’m a lobster waiting to be cooked. Kyle says Paul at least go out with some dignity self-evict. Adel says if Big Brother wants ratings, we’ll give them ratings.